Summer 2018 has arrived and the outlook for cloud service providers has never been better; Q1 IaaS (Infrastructure-as-a-Service) revenue for the big five cloud service providers (AWS, Microsoft, Google, IBM, Oracle) topped $20 billion. Q1 IaaS cloud revenue has outgrown the global server market, even after a surge in server sales in Q4 of last year. Great Managed IT Service Providers (MSPs) have moved with the market, fully embracing change and launching cloud integration practices. But maybe your MSP is still telling you the cloud isn’t secure, and that the best decision for your business is to buy a new server? Your trusted advisor certainly knows your business better than I do, but if your company already has access to metro ethernet fibre, there is a strong possibility you’re being sold Fear, Uncertainty, & Doubt (FUD). In this series, I will talk about some of the biggest myths and the FUD keeping your business out of the cloud, so that you can have an honest conversation with your MSP about streamlining your IT budget and maximizing performance, security, and efficiency by moving workloads to the cloud. If your MSP claims Azure, AWS, GCP, or Oracle Cloud are more expensive than colocation or hardware for your office, have them prove it. It’s true that cloud service pricing can seem confusing or convoluted, but the big five vendors have already made TCO (Total Cost of Ownership) calculators and other helpful tools available. 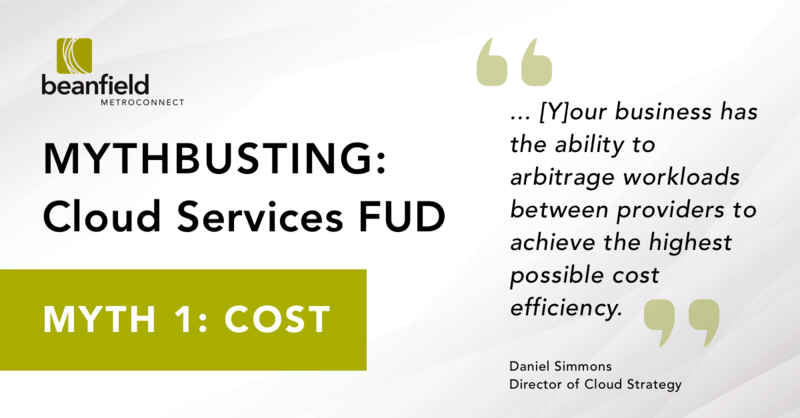 Bear in mind that if an advisor is recommending you evaluate cloud services by comparing the cost of new hardware against the cost of utility services using public Pay-as-you-Go cloud pricing, you have a problem. When was the last time you paid the sticker price for a new car? Ask your MSP for quotes from each vendor, and request committed spend discounted pricing for use as a high watermark. The best MSPs have the capability to provide cloud optimization services, detailed reporting on monthly cloud spend, and certifications with at least two or more cloud service vendors. These MSPs are leading conversations about #multicloud and these advisors are vendor agnostic. If your MSP doesn’t fit that description, you might have the wrong trusted advisor. Microsoft, Amazon, and Google are waging a price war and it is a direct benefit to your business. Each provider mentioned above has options for enterprise agreements, workload commit, and preemptible or spot rate discounts. For big data projects and analytics services, your business has the ability to arbitrage workloads between providers to achieve the highest possible cost efficiency. I guarantee your business already has a named account rep with each provider, so introduce yourself – they’re waiting to hear from you! Optimize workloads following lift-and-shift migrations, do not over-provision, and leverage auto-scaling services as much as possible. Take advantage of enterprise agreements to pre-negotiate cloud spends, and create a direct relationship with each vendor. Work with an MSP who specializes in cloud optimization services, or leverage cloud optimization platforms like Cloudyn or CloudCheckr for monthly spend reporting and cost savings insights. Lower cloud data egress fees to the lowest possible per gigabyte egress rate (data exiting the cloud) with direct connectivity services such as AWS Direct Connect, Azure ExpressRoute, and Google Cloud Interconnect. In part two of the Mythbusting: Cloud Service FUD series we will discuss Myth #2 – Vendor Lock-In. You can read the entire series as a single article on Medium here.